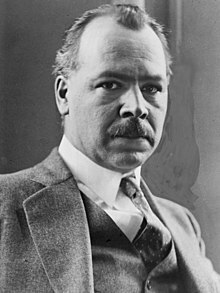 Nikolai Ivanovich Vavilov  (25 November 1887 – 26 January 1943) was a Russian botanist and geneticist. He is best known for showing how and where crop plants evolved. He devoted his life to agriculture: the study and improvement of wheat, corn, and other cereal crops. By 1940, Vavilov had accumulated a collection of 200,000 plant seeds from the Soviet Union and from abroad. He was widely admired, but his life came to a terrible end. Vavilov repeatedly criticised a powerful but poor scientist, Trofim Lysenko. As a result, Vavilov was arrested, and died of starvation in a prison in 1943. Today Vavilov's name stands high. The Vavilov Institute of Plant Industry in St. Petersburg is named after him. It maintains one of the world's largest collections of plant genetic material. This is mimicry in plants where a weed comes to look like a crop plant. Before herbicides, weeds were plucked by hand. This has been done for thousands of years. The weeds come to look like the crop because the weeders pick those weeds which look most different. Vavilovian mimicry is caused by unintentional selection by humans. The weeds that survive pass on their genes. Gradually, all the weeds look more like the crop plant. An example is rye, a common Mediterranean species. Rye was originally just a weed growing with wheat and barley. Weeding made it like the crop. Like wheat, it came to have larger seeds and more rigid spindles to which the seeds are attached. Rye is a tougher plant than wheat: it survives in harsher conditions. Having become a crop like the wheat, rye was able to become a crop plant in harsh areas, such as hills and mountains. ↑ Pringle, Peter 2008. The Murder of Nikolai Vavilov: the story of Stalin's persecution of one of the great scientists of the twentieth century. This page was last changed on 17 April 2013, at 14:41.